Few regions satisfy our threefold passions for walking, food and wine in quite the same way as Piedmont. The birthplace of the Slow Food movement, Piedmont is an epicurean dream. 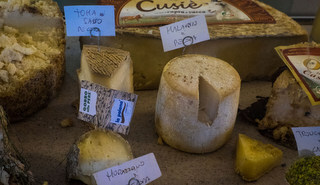 Artisan cheeses and precious truffles are served up alongside exceptional wine produced in the UNESCO World Heritage vineyard landscapes of Langhe-Roero and Monferrato in the southern part of the region. Situated in the northwest of Italy, Piedmont is bordered by Switzerland and France and surrounded on three sides by the Alps, making the region over 40% mountainous. The rugged peaks of one of Italy’s largest national parks, the Gran Paradiso, form a backdrop to the gentle slopes of the Langhe and the damp rice paddies of Vercelli and Novara while to the north, the atmospheric lakes of Maggiore and Orta provide a welcome contrast to Italy’s busier lakes. While the Langhe devotes itself mainly to grape growing, the Roero has a more varied landscape, with hazelnut orchards and forests that are home to truffles and wild mushrooms. 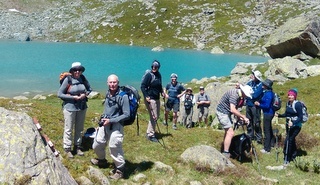 Alpine views, the gently undulating slopes of the Langhe and medieval pilgrimage routes such as the Via Francigena together make Piedmont a wonderful region for walking. Choose from dramatic hikes past waterfalls and glassy lakes set against a backdrop of snow-covered peaks, or more leisurely ambles through the forests and vineyards. At the heart of the region is Turin, the former royal capital of Savoy, and the origin of Italy’s unification movement in the 1850’s. Today, the city is equally famous for football, Fiats, car factories and a thriving café culture. Then there are churches, castles and palaces such as the Royal House of Savoy’s summer palace at Racconigi and the Reggia Venaria Reale outside Turin, providing more than a glimpse of glamour and an insight into the region’s history. Start your Piedmont gastronomic odyssey in Turin with a native bicerin - layered espresso, hot chocolate and milk in a glass - at Caffè al Bicerin. Locally-grown DOP certified hazelnuts are used to produce the finest chocolate and the creamiest of risottos are whipped up with local arborio rice. Feast on hand-crafted artisan cheese wrapped in seirass del fen (a type of hay), plump parcels of ravioli del plin cooked in butter and rosemary, snails from Cherasco and, in the autumn, white truffles from Alba. 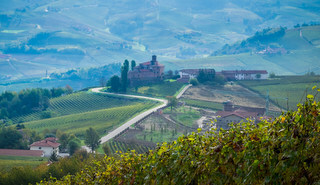 Wine lovers are equally indulged with the big-bodied red Barolo and Barbaresco wines from the Langhe near Alba, and sweet bubbly white Moscato d’Asti from the vineyards around Asti. Wine-tastings can be booked at vineyards and regional wine cellars. Top sights in the capital city of Turin include the Museo Egizio, the Palazzo Reale and the Museo Risorgimento which charts the story of Italy’s unification. Get more ideas on what to see and do in our city guide to Turin. 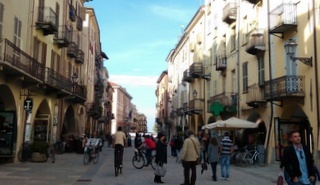 Cuneo is the capital of Piedmont, an attractive town with a Renaissance style main street while just over 30km north, Saluzzo is one of Piedmont’s most atmospheric towns, with churches, castles and historic arcaded roads. The town has shops, boutiques and some excellent restaurants. Smaller, but equally charming, medieval Cherasco also has portico-covered streets and is best known for its antiques, snails and Baci di Cherasco chocolates, made from dark chocolate and roasted Langhe hazelnuts. There are several key towns if you want easy access to vineyards and wine-tasting. 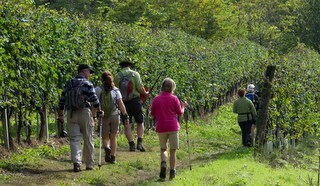 La Morra offers stunning views and is the starting point of a 14km walk through the vineyards. 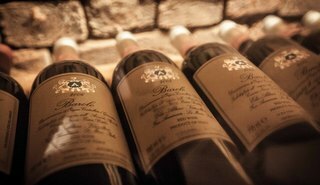 Neighbouring Barolo sits in the shadow of the Castello di Barolo, surrounded by endless rows of Nebbiolo vines and home to a Wine Museum, Enoteca and a Museo dei Cavatappi (Museum of Corkscrews). Driving from La Morra to Asti, you pass Alba and the beautiful old town of Neive which sits in the heart of the region producing Barbera d’Alba, Dolcetto d’Alba, Barbaresco and Moscato d’Asti and has a historical centre filled with elegant palazzi, grand churches and a medieval clocktower. Not surprisingly, many of Piedmont’s festivals and celebrations involve food! 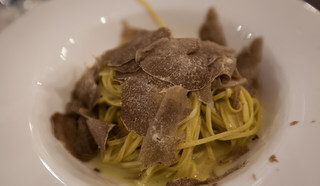 Highlights include the Alba White Truffle Fair each autumn and the Salone del Gusto, a biennial Slow Food event that showcases speciality foods from 150 countries. On alternate years, Cheese, the Slow Food’s signature event dedicated to developing the understanding of cheesemaking, takes place in Bra. 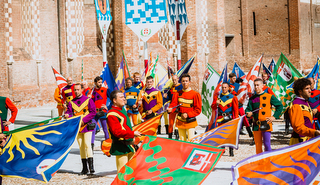 For pomp and pageantry, head for the Palio at Asti (September) while the Battaglia delle Arance is Ivrea’s very unique version of Carnival celebrations. The Stresa Festival takes place on the shores of Lake Maggiore between late August and mid-September. 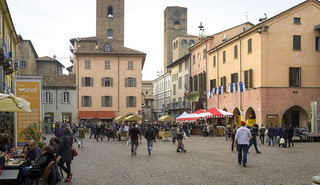 Saluzzo’s Marquisate, a historical state that included French and Piedmont territory, was the setting for the final story of Boccaccio’s Decameron. The Sacra di San Michele monastery, an ancient abbey around 40km from Turin, was the inspiration for Umberto Eco’s The Name of the Rose. You can explore Piedmont on four of our tours: The Best of the Italian Alps, the Jewels of Piedmont and France and Italy which takes the group over the Alps from Provence to Piedmont. Our tour to The Italian Lakes includes walks in Lake Maggiore and Lake Orta. Due to the size of Piedmont, we are only able to cover a part of the region on each tour but would strongly recommend extending your holiday to explore the region further, either on a consecutive tour or independently. Turin is Piedmont’s principal airport although the region can also be easily accessed from international airports in Milan, Genoa and Nice in France. For more information about Piedmont, visit the Piedmont tourist board.